The Shukhov Tower is not only the universally acknowledged world monument of architectural and engineering ideas, but also the symbol of the new hi-tech and information era. During the whole period of its existence the Tower was never restored, and the work on its modernization, carried out in the second half of the 20th century, considerably deteriorated the condition of the tower. 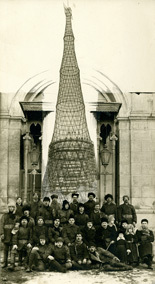 The Shukhov Tower in Moscow is the monument of cultural heritage, and according to the legislation it should be maintained by the owner in a proper working order and restored condition. Despite the existing legislation, decree of the State Duma of the Russian Federation, express directive of the prime minister of the Russian Federation and decrees of the courts the Shukhov Tower not only has not been restored but also not even once painted or protected from corrosion during the last almost 30 years. Despite such a barbarous treatment and attempts of intentional or unintentional demolition, the Shukhov Tower, thanks to the genius of its creator and actions of the Russian and international community, still sturdily stands on its place. The Moscow City Government, Government of Russia should come to a decision of volition and in the soonest possible time not only carry out an earnest scientific restoration of the Tower, but create around it a new hi-tech educational-recreational space in compliance with the tasks of the high technology age and open in Moscow a museum dedicated to the creative genius of Vladimir Shukhov.